After driving miles of country roads, I pulled up to a farmhouse surrounded by cornfields. Mine was the only car in the driveway. I hadn’t seen another one for miles, just horses pulling black buggies. An older woman wearing a plain cape dress welcomed me with a smile and walked me into the living room, where her husband sat in a rocking chair. He pulled out the tubes connecting him to the oxygen machine buzzing in the corner and pushed himself up to his feet to shake my hand. My colleagues in church leadership told me that I needed to meet this man, an Amish farmer and bishop, a wise and trusted member of his community. Because of his long history of ministry and his reputation, church people from beyond his district would pay him visits, just as I was doing, to learn from him and receive his counsel. We sat and talked for hours, exchanging our stories, talking about God, about church life. As a young man, newly married, he had been chosen bishop of his district by the casting of lots, a practice described in the first chapter of the book of Acts. All eligible men from the community had been handed a hymnal, and by providence, he had received the one with a slip of paper hidden within its pages, thus identifying him as God’s chosen bishop. And God did provide him with wisdom, through his dedication to a life of prayer and the study of Scripture, as well as a community that extended grace as he learned how to pastor them, how to guide his people in faithful devotion to God. As we spoke that day, his words occasionally picked up speed, revealing his passion for the church. But mostly he spoke slowly, careful to catch his breath. 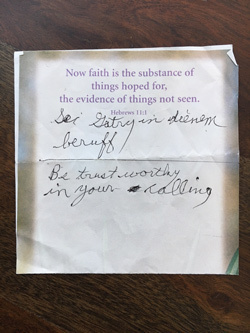 When I asked whether he had a nugget of wisdom to pass along to me, a young denominational leader, he grew quiet and looked down at his folded hands. After a long pause, he raised his pensive gaze. I still have that slip of paper. I look at it when ministry overwhelms me, when a decision weighs on my shoulders. The calling of grace -- that’s what it means to pastor a church, to guide a denomination. We are called to bear witness to God’s grace: to speak words of grace, to name the signs of grace, to administer the flow of grace throughout Christ’s church, all so that we may rest into the power of the Holy Spirit. Grace is the spirit of life, the breath of God enlivening us, bringing us from death to life, from sin to salvation. Grace is the life of God among us. “We move from sin to grace -- from death, on the one hand, to life, on the other,” writes theologian Kathryn Tanner in “Christ the Key.” God draws us into grace, into life. Last summer marked my 10-year anniversary of pastoral ministry. I already have regrets, a collection of scenes that flash through my mind, situations I wish I had handled differently, memories of mistakes. After my next decade, when I look back at the years, I want to be able to remember grace, moments when God brought life to a situation that seemed hopeless, times when I was overwhelmed with nothingness yet God made something. “God … calls into being things that were not” (Romans 4:17 NIV) -- and that’s called grace. To be true to our calling -- as I learned from the Amish bishop’s wisdom -- is to arrange our lives, our ministries and our organizations as openings for the flow of God’s grace, as portals in our world to God’s life. To bear witness to life -- that’s our calling as ministers. To offer life -- that’s the good news. To say, with our words and deeds, that Jesus has come to offer abundant life.